In The Constitution of Liberty, Friedrich Hayek gave a dire prognosis for the future of technology: "[W]e are probably only at the threshold of an age in which the technological possibilities of mind control are likely to grow rapidly and what may appear at first as innocuous or beneficial powers over the personality of the individual will be at the disposal of government. The greatest threats to human freedom probably still lie in the future." Hayek, like most of the leading intellectuals of his time, did not foresee the emergence of the Internet—the quintessential Hayekian spontaneous order. As a decentralized communication system facilitating the sending and receiving of messages by billions of people, the Internet has greatly shifted the balance of power away from governments and toward sovereign individuals. Even in its early days, the Internet played a vital role in bringing about the downfall of the Soviet Union's government. Since then, it has catalyzed tremendous economic, social, and political liberation in countries ranging from Cuba to the United States. While governments have tried to use modern communication technologies to monitor and regulate private individuals, their efforts are doomed to failure stemming from a much more powerful and competent market response. When Friedrich Hayek's The Constitution of Liberty was first published in 1960, the Internet did not exist; nor did its military predecessor, ARPANET, which was initiated in 1969. Fifteen years after the horrors of World War II, the means by which the totalitarian regimes of Nazi Germany and the Soviet Union used mass broadcasting technology to indoctrinate their people were still recent memories. During the Nuremberg Trials, Albert Speer himself expressed the Nazi regime's effectiveness at using technology to spread propaganda: "Through technical devices like the radio and the loudspeaker, eighty million people were deprived of independent thought. It was thereby possible to subject them to the will of one man." Faced with such facts, Hayek understandably feared future uses of mass broadcasting technology. Indeed, in a world where the only mass communication technologies were radio and films, the scales of power were shifted toward totalitarian governments and away from sovereign individuals. According to Christopher Kedzie, "Since traditional broadcast media are located closest to the dictator's optimum they are almost certain to be employed as a powerful political weapon." Kedzie arranges technologies along a two-dimensional continuum, with the number of message recipients from the technology on the horizontal axis and the number of message originators on the vertical axis. Technologies like radio and television—especially in their early days—are particularly conducive to government propaganda, since the number of message originators is few while the number of message recipients can be in the millions. Kedzie writes that "The optimal position, from the dictator's perspective, would be in the bottom right-hand corner where everybody receives all of the leader's dictates and none from anyone else." "Kedzie arranges technologies along a two-dimensional continuum…"
Totalitarian states with the resources to control the small number of radio broadcasts and films in existence during the 1930s and 1940s could influence their subjects without major competition from their nonstate opponents. Hayek was not alone in fearing the combination of technology and government. In 1984, published in 1949, George Orwell portrayed an all-encompassing surveillance state that completely controlled not only the present flow of information but also the historical record. But Orwell also lacked the benefit of seeing subsequent technological developments and the cost reductions they entailed for ordinary private individuals. In the words of Richard Muller, "Orwell's error was remarkably simple: he assumed that only the state would be able to afford high-tech—an assumption shared by virtually every prophet, science-fiction writer, and futurist. But it has proven to be wrong." We do not live in an Orwellian world today, in large part because of Moore's Law: "In 1965, Gordon Moore, the co-founder of Intel Corp., predicted that, every 18 months, the processing power of a silicon chip would double as transistor density increased, a forecast that has proven uncannily accurate." This exponential growth in processing power has enabled cutting-edge technology to spread beyond the purview of governments and into the hands of over a billion individuals around the world. Indeed, even technologies that were originally the province of governments tend to migrate gradually but inexorably into the private realm. Through the 1970s, ARPANET evolved from a military communication tool to an increasingly sophisticated private information-sharing system. According to Peter Klein, "By the early 1980s, private use of the ARPA communications protocol—what is now called 'TCP/IP'—far exceeded military use." In 1984, the military handed over control of the Internet to the National Science Foundation; just ten years later, the complete privatization of the Internet's basic infrastructure took place. The story of the Internet is one of piecewise relinquishment of government control and empowerment of private individuals and organizations. Unlike early radio and television, technologies with many possible message originators—such as the telephone and especially the Internet—are highly damaging to powerful governments, because they introduce competition into the market of ideas. The telephone has its weaknesses; the recipients of any given message are few, and it is possible to wiretap telephone lines and restrict their number—as the Soviet government tried to do prior to Mikhail Gorbachev's policy of Glasnost (openness). The Internet, however, is far more resilient. Unlike earlier broadcasting technologies, the Internet has no central nexus from which it can be effectively controlled and restricted. Tim Swanson notes that the Internet "is an amalgamation, an assortment of heterogeneous computer systems with varying capabilities linked together by various protocols." It is impossible to silence the Internet by seizing pieces of Internet hardware—even in a concerted effort to do so within any given country. In Kedzie's words, "Neither the autonomy nor the influence of electronic networks is constrained by national boundaries." It is entirely possible for a political dissident in one country to have his website hosted in a different part of the world—far from the reach of the authorities against whom he writes and speaks. Furthermore, the ease of republishing one's material online ensures its permanence and immunity to effective censorship. I have personally observed the futility of even one major site's attempts to remove content. The online video-hosting site YouTube has on several occasions banned videos deemed "insensitive" or in violation of the copyright restrictions of major media firms. Even though the videos and the accounts of their posters were removed, five other versions of the same video might spring up within hours on YouTube and other online video websites. The more frequently the videos were removed, the greater was the public backlash—leading to a more massive flood of videos. In virtually every case I have observed, the videos ultimately remained on YouTube and generated more exposure than they would have otherwise. If a single site cannot effectively shut down the transmission of ideas on its own property, how difficult must it be for a large, unwieldy government apparatus to combat dissent spread throughout the world! Some governments seeking to restrict the free flow of ideas have attempted to extensively limit their subjects' access to the Internet. But blocking online content is like using a sieve to stop the flow of water. China's government requires search engines such as Google to block content critical of the Communist Party. However, such censorship is ineffectual and fails to substantively restrict access to even the most "threatening" ideas. James Glassman notes with amusement that the Chinese government "blocks access to certain websites, including that of the Washington Post but not of my own far more subversive free-market technology site, www.TechCentralStation.com." Even restricting access to virtually every major Western media source would not address the millions of online articles, political blogs, small magazines, videos, and audio recordings that Chinese and other government officials do not know and cannot know about. Search engines that filter out combinations of provocative keywords still cannot detect metaphors, allegories, subtle allusions, satires, and even unusual turns of phrase. Moreover, they cannot stop individuals from using the local knowledge of their friends and associates in order to find websites without the aid of major search engines. Throughout his work, Hayek emphasizes the importance of particular knowledge of time and place in shaping individual decisions—as well as a centralized bureaucracy's inability to access such knowledge. Much of individuals' awareness of content on the Internet arises from their possession of such local knowledge. A Hayekian analysis would suggest that governments are powerless to even know the nature of this knowledge, much less to interfere with its transmission. To merely say that the Internet has made the effective large-scale censorship of ideas impossible would understate the case for the Internet as a tool of unprecedented individual liberation. The Internet has the power to bring down oppressive governments—a power that was manifested even in its early days. For instance, the Internet played an indispensable role in destroying the Union of Soviet Socialist Republics. Communism fell without the participation of the Russian army, for or against; it fell without having a new political party against the Communists—if at all, it was done by the Communists; it fell without the intervention of the United States, Europe, China or anybody else…. Authoritarian governments became weak the minute they could no longer blind their people or control information. Author Scott Shane agrees and writes that the "death of the Soviet illusion… [was] not by tanks and bombs but by facts and opinions, by the release of information bottled up for decades." The initial visible stimulus for the flood of information that led Soviet citizens to question their regime was Mikhail Gorbachev's policy of Glasnost, initiated in 1985 and gradually relaxing restrictions on access to information and travel through the late 1980s. However, Glasnost did not originate from Gorbachev's good will alone—but rather from his recognition of a technological necessity. In Gorbachev's own words from 1988, "International communication is easier now than ever before. Nowadays, it is virtually impossible for any society to be 'closed.'" [T]hey try to stifle these [information and communication] technologies and thereby fall further behind in the new industrial revolution, or else they permit these technologies and see their totalitarian control inevitably eroded. In fact, they do not have a choice, because they will never be able entirely to block the tide of technological advance. The tremendous ability of communication technologies to drive economic growth and prosperity implies that governments that do not embrace such technologies condemn themselves to falling greatly behind their freer counterparts. Failure to at least partially permit the spread of recent technological developments could be fatal to a regime that needs some semblance of economic growth to be seen as a possible alternative to Western political systems. As Kedzie notes, "a dictator who eschews interactive communications perhaps does so only at the peril of healthy economic growth." If too glaring a technological and economic disparity occurs, this alone could generate enough internal discontent to result in a coup or a rebellion. On the other hand, adopting the new technologies enables information critical of the regime to spread and become available in the marketplace of ideas. Glasnost fueled the people's anger as they discovered that most of the things they had been taught about Soviet paradise and capitalist hell were fabricated… With the increased information available in newspapers and on television, the new economic dissidents became a powerful force for dismantling the Soviet empire. Relcom (short for "reliable communication") was implemented specifically to support commercial activity otherwise stultified by the intentionally constrained Soviet telecommunications infrastructure. Supported by its own user fees, this network has blossomed to hundreds of thousands of users. Not only did Relcom liberate many Soviet citizens by enabling them to engage in economic transactions that enhanced their standards of living—it also gave them a forum for self-expression outside the purview of the government. Relcom enabled its users to spread and develop ideas, immune from oversight and the need for prior approval. Key to this ability was the very structure of the Internet. Clay Shirky writes that the Internet is based on the end-to-end principle: "What made it worth adopting in a world already well provisioned with other networks, was that the sender and receiver didn't have to ask for either help or permission before inventing a new kind of message." While even under Glasnost, the Soviet government exercised some oversight and censorship over the printed media, radio, telephones, and television—such control was impossible on the Internet by virtue of the Internet's very design. The most governments can do is filter major search engines—but engines like Yahoo! and Google did not even exist in 1989. Hundreds of thousands of Soviet citizens became informed nonetheless through Relcom, which, in Kedzie's judgment, "proved to be a powerful social weapon against centralized power." Relcom was not the sole online source influencing the downfall of the Soviet Union. More diffuse and personal means of communication—such as email—were also crucial. In Kedzie's words, "The international flow of e-mail messages strengthened the conventional media, which could no longer be deprived of outside sources for information." Fax machines and photocopiers, video recorders and personal computers outside the government were no longer exotica but a sprawling, living nervous system that linked the Russian political opposition, the republican independence movements, and the burgeoning private sector. Nor was the Soviet experience unique. At the same time, the Velvet Revolution transformed Czechoslovakia. [S]tudents were trying to coordinate the uprising across the nation and … were running a telecom angle…. The Czech secret police were far too stupid and primitive to keep up with digital telecommunications, so the student-radical modem network was relatively secure from bugging and taps…. The Communist government of Czechoslovakia was overthrown on December 29, 1989, largely due to the efforts of technologically adept students with Internet access. Two years later, the Soviet Union, too, ceased to exist. The influence of the Internet has grown by orders of magnitude since the fall of the Soviet Union. In 1997, about 96 million people used the Internet; by 2002, the number had grown to about 650 million. On December 30, 2007, the Internet had an estimated 1.319 billion users. Along with this increase in usage came increases in convenience and functionality. For every individual, the cost of sending and receiving information is a tiny fraction of what it was during the Internet's early days. According to Glassman, "Over 30 years, [from 1972 to 2002], the cost of sending 1 trillion bits of information has dropped from $150,000 to 17 cents." Email accounts were expensive and offered only several megabytes of storage in the 1990s. 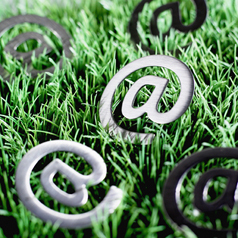 In 2008, email accounts are free to users, and popular services like Gmail and Yahoo! Mail offer practically unlimited storage that increases faster than mailboxes fill up with content. Any individual can publish his ideas online without even needing to pay for a website. Free websites offered by services like Yahoo! GeoCities—along with hundreds of forums, blog hosting sites, and free publication venues—give any willing person a chance to share his thoughts, engage in discussion and debate, and build up his audience and reputation. Websites such as YouTube enable users to easily create and share video content, while the emergence of high-speed Internet connections has rendered the uploading and downloading of thousands of audio files possible for every connected individual. "To merely say that the Internet has made the effective large-scale censorship of ideas impossible would understate the case for the Internet as a tool of unprecedented individual liberation. The Internet has the power to bring down oppressive governments—a power that was manifested even in its early days." The original vision that the creators of PayPal (Peter Thiel, a hedge fund manager, and Max Levchin, an engineer who originally was from the Ukraine) had in mind was a system that would permit people around the world not only to be able to pay each other via the Internet, but also to be able to protect themselves when their governments were inflating their currencies. Paper money is an ancient technology and an inconvenient means of payment. You can run out of it. It wears out. It can get lost or stolen. In the twenty-first century, people need a form of money that's more convenient and secure, something that can be accessed from anywhere with a PDA or an Internet connection. Services like PayPal can bring increased financial security to residents of countries where inflation is rampant. By having dollar-denominated accounts instead of accounts denominated in local currencies, individuals can reduce the annual percent inflation they suffer to the low single digits. With services such as e-gold and other commodity-denominated accounts, individuals no longer need to suffer inflation at all. They can, moreover, transfer money across borders without facing restrictions from their own governments. As Internet commerce develops, more individuals around the world will be able to work and exchange money online—bypassing the economic restrictions and regulations of some of the world's most oppressive governments. Socially, the Internet empowers individuals as well, by enabling them to build firmer personal networks unbound by the constraints of geographic proximity. A 2006 study by the Pew Internet Project found that vast numbers of individuals make extensive use of the Internet "especially in times of crisis when people use it to mobilise their social networks." When individuals need vital information or assistance with issues regarding health, work, finances, and the government, they contact those of their acquaintances whom they consider the most qualified to offer help. According to sociologist Barry Wellman, coauthor of the study, "Rather than relying on a single community for social support, individuals often actively seek out a variety of appropriate people and resources for different situations." The Internet broadens individuals' knowledge of the particulars of time and place by keeping them connected to more places at more times. The Internet also helps individuals minimize the involvement of government in their lives by saving time even while dealing with the same bureaucratic red tape. Instead of having to expend time and resources procuring hard copies of their tax forms, individuals can obtain, fill, and file these same forms on the Internet—without leaving their homes or waiting in line. Electronic filing services such as TurboTax enable free filing and provide assistance to individuals seeking to comply with tax laws. Now it is no longer necessary for most individuals to spend exorbitant amounts of money paying tax accountants and lawyers just so that they can "correctly" pay the government. Individuals use the time freed from regulatory compliance to enrich their lives and develop their spheres of autonomy through work and leisure. Politically, the Internet has been able to massively empower individuals suffering under oppressive governments. In 2008, Cuban authorities made a futile effort to shut down Generacíon Y, the blog of Yoani Sanchez regarding the realities of how ordinary citizens live in Cuba. The blog is hosted by a German server—so the Cuban government does not have any practical ability to shut it down; at most, it can prevent access to it from within Cuba. Just after the government attempted to block access to the blog, Sanchez was awarded the Ortega Y Gasset Prize in Journalism—the Spanish-language equivalent of the Pulitzer Prize. The Cuban government's effort at censorship generated far more publicity for Sanchez than she would have had if the government had simply left her alone. Sanchez herself understands that the authorities are powerless to stop her. In her words, "The anonymous censors of our famished blog have tried to lock me up in the room, turn my lights off and prevent my friends from coming in…. However, the punishment is so useless that it invites pity and so easy to elude that it becomes an incentive." Now even blocking access to Generacíon Y within Cuba has proven impossible: "Sanchez says the Cuban government periodically attempts to block her site within Cuba, though the problem is always cleared up within hours." As of April 2008, it seems that the government of Raul Castro has succumbed to the same dictator's dilemma that Gorbachev faced in 1985. In order to avoid the embarrassment and upheavals caused by falling technologically far behind the rest of the world, Castro's regime has greatly relaxed restrictions on ordinary Cubans owning cell phones and computers. While access to the Internet is still restricted to Internet cafes open to tourists only, ingenious bloggers like Sanchez have often managed to sneak in wearing tourist garb. Other bloggers, like Eva Hernandez and Sanchez's husband, Reynaldo Escobal, have followed suit. Cuba may be experiencing the beginnings of its own period of Glasnost—which will inevitably render policies of censorship and governmental repression unsustainable. The political liberation brought about by the Internet is not limited to countries suffering under Communism and other forms of authoritarianism. In the United States, the Internet's burgeoning political clout was manifested in Texas Representative Ron Paul's run for the presidency. Ron Paul—an opponent of the income tax, the Federal Reserve, undeclared wars, lavish welfare programs, economic protectionism, gun control, the War on Drugs, and government surveillance of the general population—is perhaps the strictest constitutionalist on the American political stage since the time of Grover Cleveland. In the 2008 Republican primaries, Paul won from 3% to 25% of the votes—with second-place finishes in the Nevada, Montana, and North Dakota primaries as well as in the Louisiana caucuses. While Ron Paul is unlikely to win the Republican presidential nomination, he would not even have been politically visible without the Internet. Paul's prominence was the result of an immense grassroots network of libertarian and constitutionalist political activists, young people, and online businessmen who generated more Internet exposure for Paul than existed for any other candidate. Without any central direction from Paul's campaign, Ron Paul broke fundraising records in the "money bombs" of November 5 and December 16, 2007, raising $4.3 million and $6.0 million respectively in 24-hour intervals—fed entirely by online grassroots donations. Although heavily marginalized as a "long-shot candidate" and shut out of debates by the FOX News Network, Ron Paul generated a tremendous outpouring of support on YouTube—where new videos of and about Rep. Paul were posted almost every minute. Paul's number of YouTube subscriptions outnumbered those of any other candidate; his name remains a top search term on the blog network Technorati; it was also a top Google search term for months. Ron Paul's campaign shows that the still-young Internet is highly conducive to the spread of ideas in support of free markets, private property rights, and individual liberty. After all, Paul lists Friedrich Hayek, Ludwig von Mises, Murray Rothbard, and Grover Cleveland among his chief influences and has pictures of them on the wall of his office. He has consistently voted against any legislation he considered unconstitutional, earning him the nickname "Dr. No." Moreover, a 2006 CNET News.com study rated Rep. Paul as America's Internet-friendliest politician—embodying his stance for Internet freedom in his voting record more often than any other American federal politician. A politician's advocacy of liberty, friendliness to the Internet, and popularity on the Internet seem to be linked. If the ideas favoring sound economics and individual freedom have channels by which they can spread outside the influence of political and mass-media establishments, they will come to resonate with large numbers of people. In the words of Stephan Kinsella, "free-market economics is true; whereas socialist political and economic theory is self-contradictory, pseudo-scientific, and bankrupt." Thus, when a thinking individual is exposed to free-market ideas, he will be more likely to accept them than not—provided that the ideas can be presented fairly and fully. Kinsella posits a hope that the increasing accessibility of sound economic and political thinking via the Internet "will lead to an eventual enlightened populace that throws off the chains of statism as incompatible with the basic values of civilized people." One can only speculate and hope regarding the extent to which ideas like those of Rep. Paul will gain exposure and support via the growing Internet by the time of the 2012 elections. Of course, governments can and do attempt to use even contemporary decentralized technologies in order to increase their ability to monitor, regulate, and restrict individuals. But they cannot succeed in the long run. After all, the most advanced technologies accessible to governments today are fundamentally market driven, meaning that they are driven by the choices of individual consumers, who do not wish to be monitored, regulated, and restricted. Whether a particular technology is adopted or rejected is no longer subject to the decisions of government officials or even firms in partnership with governments. Rather, according to Glassman, "technology emerges from a process, undirected by the state or any other central authority, that encourages variety, spontaneity and discovery through trial and error. The incentives that motivate this process depend on free minds operating within free markets." Businesses cannot force technologies that consumers do not want onto those consumers; if they tried, they would quickly lose market share. Timothy Terrell notes a trend common throughout history: "Technologies that do not present the consumer with any significant cost or quality advantage will quickly disappear." technology also provides countervailing power. While government may now have the power to eavesdrop on conversations a mile away, the speakers themselves now have the power to block the reception. Government can intercept Internet messages, but the senders of those messages can encrypt them in a way they could never encrypt written messages. The people who design applications for private use on computers are either professionals who earn a living doing so or enthusiasts who, following a sincere passion, have exposed themselves extensively to such technology for years. The millions of such people throughout the world, each working on his own project in his own way, can surely design systems that are more effective than any government controls intended to stifle individual communication and exchange. In the meantime, many leading government officials remain astoundingly ignorant of even the basic nature of the Internet. Alaska Senator Ted Stevens's embarrassing characterization of the Internet as a "series of tubes" in 2006 has become symbolic of the depth of such ignorance. Stevens—who is no mere senator but the head of the Senate Committee on Commerce, Science, and Transportation, which is responsible for regulating the Internet—also said in the same speech that "an Internet was sent by [his] staff at 10 o'clock in the morning on Friday." If the top Internet regulator in the United States believes that an Internet is a series of tubes that can be sent through itself, one can only imagine how much about the colossal variety of individual online interactions the rest of the government regulators do not know and will not know in the foreseeable future. The historical struggle of individuals to escape from violence and persecution at the hands of governments is by no means over. However, technology has increasingly come to be on the side of the sovereign individual. True to the spirit of Hayek's teachings, the Internet has emerged as a massive spontaneous order that nobody could have planned or foreseen. It has gone far outside of its original military purpose and evolved into a global medium for communication, transaction, and liberation. On the Internet, every individual who wishes to can be an author, artist, musician, student, businessman, employee, and activist. He can run laps around the efforts of governments to catch up with his activities, and he can assist in bringing down the more egregious governments by exposing their errors, fabrications, and atrocities in the free marketplace of ideas. As more individuals like Yoani Sanchez and Ron Paul emerge by means of the Internet, the inevitable long-term result will be a freer, happier, more prosperous world. * This article was originally published on September 9, 2008, on Mises.org. "Velvet Revolution." Wikipedia, the Free Encyclopedia. "Internet Serves as 'Social Glue.'" BBC News. 26 January 2006. "Cuban Bloggers Defy Government Control." CBS News. 24 April 2008. "Ron Paul." Wikipedia, the Free Encyclopedia. "Series of tubes." Wikipedia, the Free Encyclopedia. • Anderson, William L. 2005. "The Genius and Struggle of PayPal." The Ludwig von Mises Institute. 1 April 2005. Available at http://www.mises.org/story/1710. Accessed 26 April 2008. • "Cuban Bloggers Defy Government Control." CBS News. 24 April 2008. Available at http://www.cbsnews.com/stories/2008/04/24/world/main4044051.shtml. Accessed 26 April 2008. • Dorn, James A. "Book Review: Dismantling Utopia: How Information Ended the Soviet Union." Cato Journal, Vol. 16, No. 2 (Fall 1996). Available at http://www.cato.org/pubs/journal/cj16n2-7.html. Accessed 26 April 2008. • "Glasnost." Wikipedia, the Free Encyclopedia. Available at http://en.wikipedia.org/wiki/Glasnost. Accessed 26 April 2008. • Glassman, James K. "The Virtuous Circle." Speech for the Mont Pelerin Society Meeting in London. 6 October 2002. Available at http://www.aei.org/publications/pubID.14370,filter.all/pub_detail.asp. Accessed 26 April 2008. • Gorbachev, Mikhail, speech delivered before the United Nations, New York, trans. Novosti Press Agency Publishing House, December 7, 1988. • Hayek, F. A. The Constitution of Liberty. Chicago University Press, 1978, p. 216. (Paperback edition). • "Internet" Wikipedia, the Free Encyclopedia. Available at http://en.wikipedia.org/wiki/Internet. Accessed 26 April 2008. • "Internet Serves as 'Social Glue.'" BBC News. 26 January 2006. Available at http://news.bbc.co.uk/1/hi/technology/4644666.stm. Accessed 26 April 2008. • Kedzie, Christopher. 1997. "The Case of the Soviet Union: The Dictator's Dilemma." 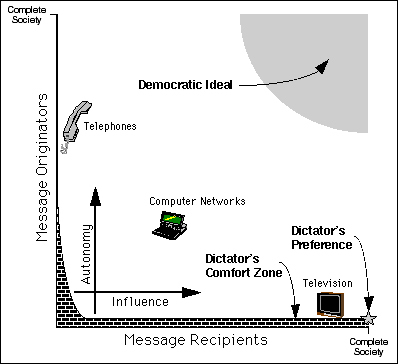 Communication and Democracy: Coincident Revolutions and the Emergent Dictators. RAND Corporation. Available at http://www.rand.org/pubs/rgs_dissertations/RGSD127/sec2.html. Accessed 26 April 2008. • Kinsella, N. Stephan. "Only Technology (and Economic Education) Can Save Us." Ludwig von Mises Institute. 5 September 2006. Available at http://blog.mises.org/archives/005567.asp. Accessed 26 April 2008. • Klein, Peter G. "Government Did Invent the Internet, But the Market Made It Glorious." Ludwig von Mises Institute. 12 June 2006. Available at http://www.mises.org/story/2211. Accessed 26 April 2008. • Llosa, Alvaro Vargas. 2008. "The World's Bravest Blogger." The Independent Institute. 2 April 2008. Available at http://www.independent.org/newsroom/article.asp?id=2160. Accessed 26 April 2008. • McCullagh, Declan and Anne Broache. 2006. "Grading Congress on High-Tech Cred." CNET News.com. 2 November 2006. Available at http://www.news.com/Technology-voter-guide-2006---Grading-Congress-on-tech-cred/2009-1040_3-6131719.html. Accessed 26 April 2008. • Muller, Richard A. 2002. "Who's Afraid of 1984?" 12 July 2002. MIT Technology Review. Available at http://www.technologyreview.com/Infotech/12905/?a=f. Accessed 26 2008. • Orwell, George. 1949. 1984. Signet Classic. New American Library. 1984. • Peres, Shimon. Address at Foreign Ministry seminar marking the First Anniversary of the signing of the Declaration of Principles. 11 September 1994. • "Ron Paul." Wikipedia, the Free Encyclopedia. Available at http://en.wikipedia.org/wiki/Ron_Paul. Accessed 26 April 2008. • "Series of tubes." Wikipedia, the Free Encyclopedia. Available at http://en.wikipedia.org/wiki/Series_of_tubes. Accessed 26 April 2008. • Serra, Elia Varela. 2008. "Cuba: Blocked Blogger Yoani Sanchez Receives Prestigious Award." 8 April 2008. Available at http://www.globalvoicesonline.org/2008/04/08/cuba-blocked-blogger-yoani-sanchez-receives-prestigious-award/. Accessed 26 April 2008. • Shane, Scott. Dismantling Utopia: How Information Ended the Soviet Union. Chicago: Ivan R. Dee, 1994. p. 215. • Shirky, Clay. 2007. "The Internet's Output is Data, But Its Product is Freedom." 10 July 2007. Many2Many. Available at http://many.corante.com/archives/2007/07/10/the_internets_output_is_data_but_its_product_is_freedom.php. Accessed 26 April 2008. • Shultz, George P. 1985. "New Realities and New Ways of Thinking." Foreign Affairs. Spring 1985. pp. 705-721. • Sterling, Bruce. 1995. "Triumph of the Plastic People." Wired. January 1995. pp. 101-158. • Swanson, Tim. 2005. "The Evaporation of the FCC." The Ludwig von Mises Institute. 11 August 2005. Available at http://www.mises.org/story/1881. Accessed 26 April 2008. • Terrell, Timothy. 1999. "Hoodwinked by Technology?" The Free Market. November 1999. Volume 17, Number 11. Available at http://www.mises.org/freemarket_detail.aspx?control=271. Accessed 26 April 2008. • "Velvet Revolution." Wikipedia, the Free Encyclopedia. Available at http://en.wikipedia.org/wiki/Velvet_Revolution. Accessed 26 April 2008.